The starting point will be at Western Avenue, in front of the National Stadium Surulere, opposite Teslim Balogun Stadium. The finish will be in front of Eko Atlantic City, Victoria Island. Participants driving are advised to park their vehicles at the Teslim Balogun Stadium or the National Stadium as most roads around the start area will be closed. Attempts to drive to the areas may cause congestion and delays and violators may be sanctioned. Participants are advised to come early to avoid delays. Dates for collection of Running Numbers at Teslim Balogun Stadium shall be announced shortly. 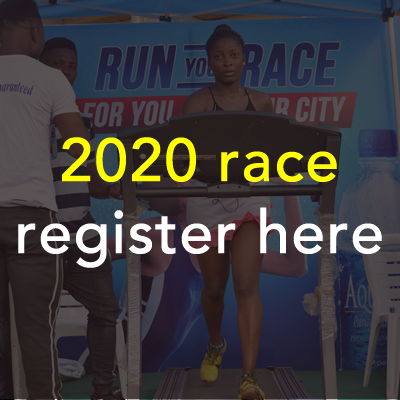 Participants are advised to come with proof of identification when coming to collect their running numbers. Peradventure, participants intend to have their running number collected on their behalf; the person collecting must come to our office with the printed out copy of the form or the final confirmation received by e-mail. They must have proof of their identity in order to do this. – All participants will receive a running race vest, and finishers will receive medals and certificate. The temperature will be approximately 22-27degrees Celsius at the start. All finishers of the marathon will receive medals and certificates. The race will be timed using the “Time tronics electronic timing system. Chips/Tags will be attached to the race bib number you will receive in your race pack. Do not remove this tag from your bib number. Water Stations will be provided at 2.5km,5km,7.5km,10km,12.5km,15km,17.5km20km,22.5km,25km,27.5km,30km,32.5km,35km,37.5km,40km,and at the finish. Sponges will be provided at the following stations on the Marathon route: 5km, 10km, 15km, 20km, 25km, 30km, 35km and 40km. Toilets will be provided after the following stations on the Marathon route: 5km, 10km, 15km, 20km, 25km, 30km, 35km, 40km and at the finish. An Ambulance and medical station will be available approximately 200 meters after each main drink station on the Marathon route at 5km, 10km, 15km, 20km, 25km, 30km, 35km, 40km and at the finish. Medics will also be present at every intermediary station. Top artistes and a selection of other activities will be available at the finish point to entertain the participants and supporters. Food and Beverage facilities will also be available here.